A powerful lightning strike can create the kind of massive pressure needed to create shocked lamellae, atomic structures that were previously thought to result from a meteor impact, or a nuclear explosion. Such structures, which form under an estimated pressure of at least 10 gigapascals and lack of hot temperature, were first discovered when scientists studied blast sites of underground nuclear tests. Then it turned out that they are encountered worldwide in craters left by meteor impacts. Volcanoes cannot produce such pressure, so geologists long considered the presence of shocked quartz or other minerals as good evidence pointing to the impact origin of a crater. But according to a new study published in the journal American Mineralogist, bolts of lightning can induce the type of changes in atomic structure that create shocked minerals. 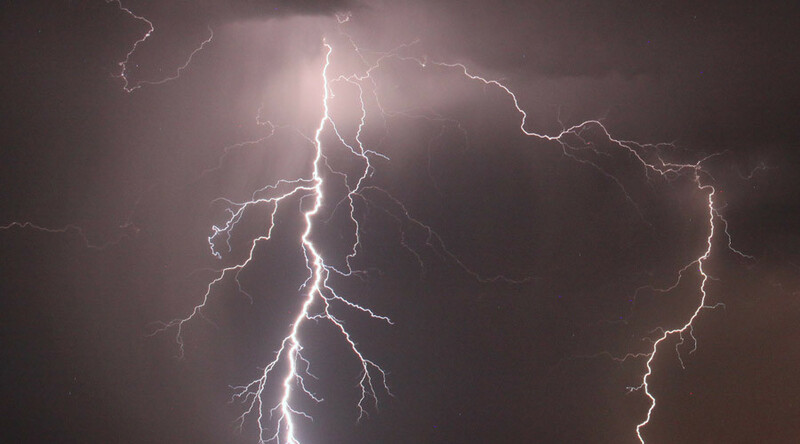 "I think the most exciting thing about this study is just to see what lightning can do," co-author Reto Gieré of the University of Pennsylvania told PhysOrg. "To see that lightning literally melts the surface of a rock and changes crystal structures is fascinating." Gieré and his fellow mineralogists from the Albert-Ludwigs-Universität, the GeoForschungsZentrum Potsdam and the Australian Nuclear Science and Technology Organization went to Les Pradals in southern France to study fulgurites. They are glass tubes that are left behind after lightning strikes sediment or rocks. When they observed through a powerful electronic microscope a sample taken just next to a fulgurite, they found something they didn't expect - a set of straight, parallel lines, and the shock lamellae. They could be found only in a three- micrometer thick layer surrounding the fulgurite, indicating that the energy from the strike, which produced the enormous pressure needed for the lamellae to form, dissipated over that distance. The discovery means that geologists should be careful about their conclusions about crater origins, if they are based on shocked quartz finds, Gieré said. "Most geologists are careful; they don't just use one observation," he said, "But this is a good reminder to always use multiple observations to draw big conclusions, that there are multiple mechanisms that can result in a similar effect."